The Current Activity reports are intended for more frequent usage and geared toward audiences more directly involved with the work of the project. For example, project teams can use these reports at weekly status meetings. Functional groups in a project can use these reports to quickly check how they are measuring up against the project plan. 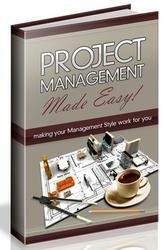 You might rely on these reports toward the end of projects, when current task status must be monitored frequently. There are six standard reports in the Current Activity category (see Figure 12-14). Figure 12-14. The Current Activity Reports dialog box shows the available reports for this category. Tasks in the project that have not had any actual progress reported are displayed in the Unstarted Tasks report. Generally, the number of tasks displayed decreases as the project progresses, so this report can be especially useful toward the end of the project. This information can help with planning expenditures, deploying tools and materials, and assessing quickly the amount of the work yet to be done. This report is also effective at showing functional leads and team members the scope of their required efforts. Figure 12-15. The Unstarted Tasks report shows all tasks that have no progress reported on them. The Tasks Starting Soon report is actually a subset of the Unstarted Tasks report. The format is similar to the Unstarted Tasks report (see Figure 12-15). The difference is that the Date Range filter is applied. You specify the dates for the tasks you want to see in the report. 2 In the Reports dialog box, double-click Current Activities and then double-click Tasks Starting Soon. The Date Range dialog box appears. 3 In the Show Tasks That Start Or Finish After box, enter the date after which you want to see tasks that are scheduled to start or finish. This is the beginning of the date range of tasks for your report. Click OK.
4 In the And Before box, enter the date before which you want to see tasks that are scheduled to start or finish. This is the ending of the date range of tasks for your report. Click OK to see the results. Note The date range can yield a surprisingly large number of tasks. For example, if there are many summary divisions in a large project plan, each subgroup will have several tasks in a certain date range. The functional managers are aware of all these tasks, but when the entire project is displayed, the total number of tasks in that range can be an eye-opener. Conversely, if a large date range is entered and few tasks reported, this can indicate a high-risk time period. Figure 12-16. The Tasks In Progress report shows all tasks currently in progress, grouped by the month in which progress is reported. Grouping tasks by the month of their start dates helps managers see the longest ongoing tasks that are still unfinished. Using this report regularly helps prevent managers from overlooking (or forgetting) the status updates and long-overdue tasks. The Tasks In Progress report is based on the Entry table with the Tasks In Progress filter applied. The report includes the task duration, start and finish dates, predecessors, indicators, and assignment schedule information. The other end of the spectrum of status reports about current progress is the report showing all 100% completed tasks, as grouped by month (see Figure 12-17). Figure 12-17. The Completed Tasks report shows all tasks that are reported as complete so far. The Completed Tasks report is significant for both historical reference and as a record of the team's accomplishment. It provides real data about "lessons learned," helps estimate task durations for future projects, and gives you a general idea of how much work is left to do in the current project. Another important use of this report is to boost team morale, increase motivation, and foster pride in team accomplishments. Although the project goal is paramount, accomplishments to date can be recognized. The Completed Tasks report is based on the Summary table with the Completed Tasks filter applied. The report includes the task duration, start and finish dates, total cost, and total work. The Should Have Started Tasks report, most effective when used regularly, alerts you to all tasks whose scheduled start dates have passed but for which no progress information has been reported to indicate that work on the task has begun. Sometimes, the data shown in this report reflects missing status updates, making this report an effective tool for optimizing the flow of communication on project progress. When you select this report, you're prompted to enter a Should Start By date. Any tasks that do not have an actual start date entered and that are scheduled to start on or before a given date (usually the current date) are displayed in this report (see Figure 12-18). Figure 12-18. The Should Have Started Tasks report shows all tasks that are due to start, but have no actual start date reported. The Should Have Started Tasks report is based on the Variance table with the Should Start By filter applied and sorted by start date. The report includes the baseline and scheduled start and finish dates, along with the start variance field. It also includes task notes and subtables for successor task to show the tasks immediately affected by those starting late. 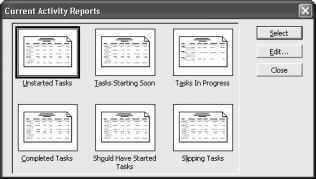 The Slipping Tasks report is used only with projects that have a saved baseline. That is, the report cannot be generated unless baseline information exists. The emphasis of this report is a list of tasks that have started, but that will finish after their baseline finish date. This slipping of the finish date can be caused by the start date occurring later than originally planned or by an increase in the duration. This report helps you determine which tasks might require added resources, which tasks might require replanning of their duration, and which tasks have become (or might soon become) critical. dates, along with the start variance field. It also includes task notes and subtables for successor task to show the tasks immediately affected by the slipping tasks. For more information about saving and using a baseline, see Chapter 10, "Saving a Baseline and Updating Progress."